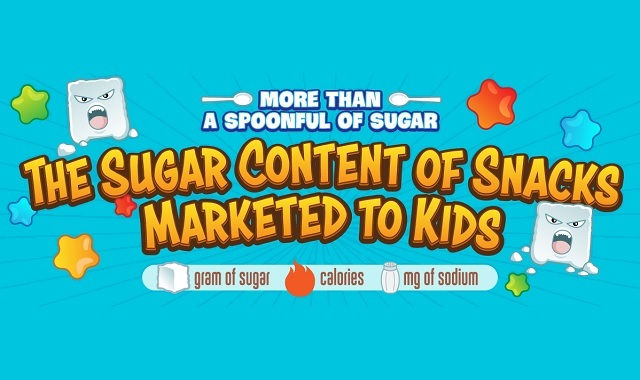 The Sugar Content of Snacks Marketed to Kids #infographic ~ Visualistan '+g+"
Children are constantly bombarded with advertisements featuring sugar-laden, addictive foods such as Gatorade, McDonald’s Happy Meals, fruit snacks, apple juices, sweetened cereals, and more. 90% of food and beverage ads showcase products that are high in sugar, sodium, and fat. On average, children ages 2 to 5 see 582 snack ads per year! The American Heart Association recommends that children only consume 12-25 grams of sugar daily (no more than 6 teaspoons of added sugar), yet many snacks visualized on this infographic exceed that all on their own. Too much sugar can lead to tooth decay, hyperactivity, obesity, type 2 diabetes, poor nutrition, and more. Researchers have noticed that the rise of childhood obesity is linked to the increase in consumption of sugary beverages. Some of these snacks and beverages are advertised as being healthy, when in reality, the added sugar far outweighs the nutritional value. This infographic from AAA State of Play visualizes the amount of sugar packed into 47 snacks and beverages commonly marketed towards kids to help parents, teachers, and children make more informed choices.